← More Time with Friends. Loaded up with souvenirs, more wines, cheeses and chocolates we set off from Adelaide towards the Great Ocean Road and our next step into our adventure. A little place called Victor Harbour was where we were heading, not too far to travel making it an easy day for our first one back on the road. Night time temperatures were quite cool so powered sites will be a must for most of this leg of our trip and hopefully good camp kitchens to cook and eat in. Adare Caravan Park was where we were spending the night, it was a lovely quiet place up in the hills but not too far from town and the beach. It is run by the Uniting Church, the grounds are well kept and the old buildings were beautiful. We cooked up pasta for dinner, not a good as Max’s though, and spent a quiet night in. Victor Harbour from the lookout where we had our lunch. Campsite at Adare CP, Victor Harbour. Wednesday 24th August we packed up and went into town to have a look around before heading off, we were not in a rush. Granite Island is just across the harbour, you can take the horse drawn tram or walk across. Walking was our choice as we knew we’d be in the car later. The views were fabulous from the top of the island and the walk around the island is easy. After walking around the town we had morning tea then got back in the car to head to Keith for the night. We stopped for a late lunch in a sweet little place called Milang at Anzac Park. It was here we met a lady and her dog out for a walk in the sunshine, she was in for a chat. Later we found out from her it was her husband’s birthday, he had only passed away a few months ago, and his memorial was in the park he had done a lot of the work on the place. She was sad and lonley and it bought tears to our eyes when we talked about her later. Chatting to her we could tell she was glad of an ear to listen for a while. Back on the road we were happy that we were able to bring a little bit of cheer to a hard day for her. 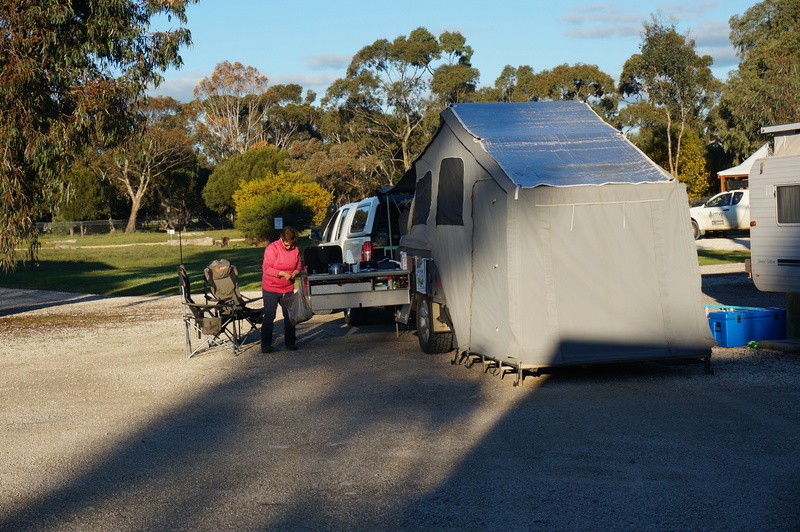 We caught a ferry across the Murray River again and arrived in Keith where we stayed at a council run caravan park and enjoyed a curry to keep warm. Keith CP, cooking curry for dinner as it cooled off. Our drive on Thursday took us through a couple of wine regions Padthaway and Coonawarra. I can’t believe we travelled straight through without stopping. Sacrilege, I know. Naracoorte was where we had a stop for a cuppa and a walk in the fresh air. We came across a fascinating memorial park to Father Woods, a parish priest who had dedicated many years to the community in the Coonawarra region. Many quaint little towns along the road this day on our way to Mount Gambier. The things you see on the road. Central Caravan Park is just around the corner from the main drag in Mount Gambier, we were staying her for two nights to have a good look around. Our caravan park manager gave us good advice of where to eat dinner, the South Australian Hotel and made sure we had vouchers for drinks. At Central CP in Mount Gambier. We took a walk around the main shopping precinct of the town. There is certainly no lack of eateries or pubs in Mount Gambier, which is the major service centre for the Limestone Coast. Dinner at the South Aussie was fantastic. We arrived early for happy hour. The special of the night was Scoth fillet with your choice of sauce, Dianne for me and gravy for Murray plus salad/veges and chips all for $15 each and we got our free drink with it. Another walk around the streets taking in the ambience of the evening before returning to our abode for the night. Friday was all about taking in the sites around this pretty town. Firstly we headed out to the crater lakes which were set in stunning backdrops of greenery with glorious panoramic views. We would have liked to walk around Blue Lake as it was only 3.6km around but the rain was against us, so we settled for driving and still enjoyed the vistas. Blue Lake wasn’t blue at this time of year as it only changes colour in the warmer weather, around October onwards, it’s all to do with the light the water receives but it was still picturesque and worth the look. This lake is also the town water supply. Next we went to Mac Park where Murray used to race his motorbikes back in the day when he lived in Klemzig. Everywhere is very green at the moment making places like this look fresh and vibrant. From her we went to the sunken gardens, Umpherston Sinkhole, which has to be seen to be believed. We walked around the rim taking in the size and depth, a spectacular sight from above as well as from within. The sinkhole was originally beautified by James Umpherston around 1886 and it doesn’t cost to enter it. Stunning. Friday night we cooked our own dinner and then enjoyed another stroll around this nostalgic town, which looks better under the night lights. Saturday came all too quick and we were once again on the move. The day was turning out okay as we travelled towards Warrnambool and the beginning of the Great Ocean Road. We crossed our fifth border on this trip, stopped at Nelson on the river for a cuppa then had lunch in Portland near the wharf. The Police helicopter was on display to the public while the officers enjoyed their lunch break before they continued their search for some armed robbers. It was a big day in Portland as there was also a whale and her calf about a hundred metres off shore frolicking about in the surf. Wow, how lucky were we to be there. 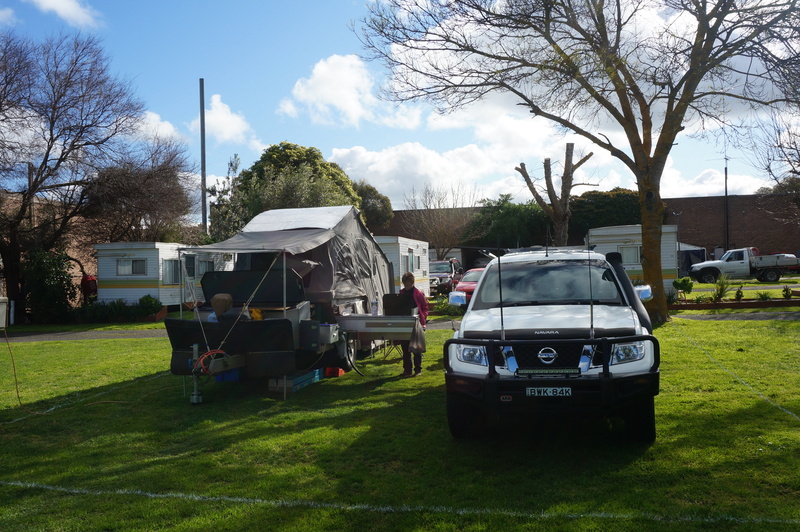 On arrival in Warrnambool we booked into the Surfside Caravan Park. This park had the best camp kitchen to date. Full serviced kitchen, separate dining area with to and heater and an undercover BBQ area that could be opened up or closed in a with heats as well. It was nice to sit in here out of the cold. Everything we needed was in this camp kitchen except utensils, pots, pans and plates. They provide the tea towels, sponges and washing up liquid. The amenities were pretty good too, spacious and quite modern. This park is council run and they have done a fantastic job. It was here we met up with a couple from Tasmania that we had actually met last year at the Molong Caravan Park. Small world. Kitchen with two ovens. Three sinks microwaves, three cooktops and heaps of bench space. Sunday morning we were going to hit the Great Ocean Road and yes that’s another blog. This entry was posted in Adventure, everything, Friends, Life, New People, South Australia. Bookmark the permalink. 1 Response to Victor Harbour to Warrnambool.